Selangor, Malaysia, Oct 30, 2015 - (ACN Newswire) - A common evergreen seed is capable of providing almost 150,000 person-days of employment during a single collection season in the Kumaun Himalayas region of northern India, according to a recent study in the Pertanika Journal of Social Sciences & Humanities. The study, by Dr Girish Chandra Pant of the Indian Council of Forestry Research and Education, assessed the present and future resource potential of Sal seeds, existing market mechanisms and their role in livelihood generation for rural communities in India. The Sal tree, Shorea robusta, is an evergreen species native to India, Myanmar and Nepal. Sal seeds are an important non timber forest product and source of income for about 90,000 forest fringe villages with a combined population of 56 million. 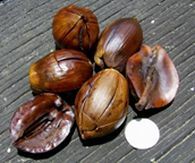 The Sal seed is prized mainly for its oil, which has significant potential for export markets due to its low price. During the months of May and June, many rural people in central, eastern and northern India collect the seeds in order to supplement their incomes until the agricultural season begins. "There is an urgent need to attract villagers to Sal seed collection work, fix the procurement rates at a level that allows at least a minimum wage to be collected by the collectors, assess the sustainable harvesting levels and practices to ensure timely processing of the seeds to preserve their quality, and increase awareness among collectors to avoid the use of unhygienic sacks and pesticides for storing kernels," states Dr Pant. Based on his investigation of Sal seed collection activities at three sites in Uttarakhand state in northern India, the author recommends that clear-cut guidelines be set for estimating collection quantities so that planning for collection and marketing can be prepared accordingly. In addition, "the government should review the decision to ban Sal seed collection in Kumaun and allow the use of Sal fat in food items such as chocolates and ice creams," he concludes. The current ban on collecting Sal seeds in Kumaun was imposed to improve the regeneration of Sal trees in this region.